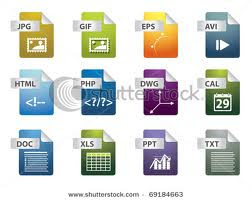 The standard or default format for saving spreadsheets is known as xls format because the file extension is .xls. However, in addition to the standard format for saving spreadsheets, there are a number of alternative formats you can use for different purposes. · PDF (Portable Document Format). When you save a spreadsheet as a PDF it can be viewed but not edited by others. The PDF forat is very widely used, so it is ideal if you want to publish your spreadsheet online and allow anyone to down load and view it (even if they don’t have a copy of Microsoft Office). · HTML (Hyper Text Markup Language). Saving your spreadsheet as HTML means you could include the spreadsheet as part of a web page. As with PDF, your spreadsheet can be viewed but not edited in this format. · CSV (Comma Separated Values) file. This is a text file with the contents of each cell separated by comma. This format can be used to import the spreadsheet data into a database application. This is a plain text file. This is an industry standard format so is useful when you need to export spreadsheet data to other application (especially non-Microsoft ones) such as a database. When you save your spreadsheet in any of these formats, the formulae are converted to values. This means you have created a final version of the spreadsheet.